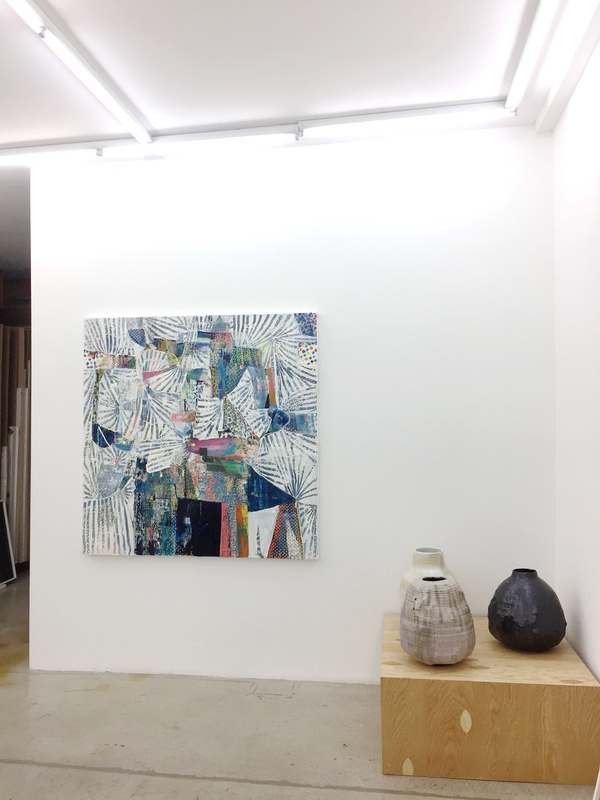 A dramatic installation of an exhibition by Los Angeles artist Adam Silverman at Cherry and Martin gallery gave me the impression that the gallery space, all of a sudden, had expanded. 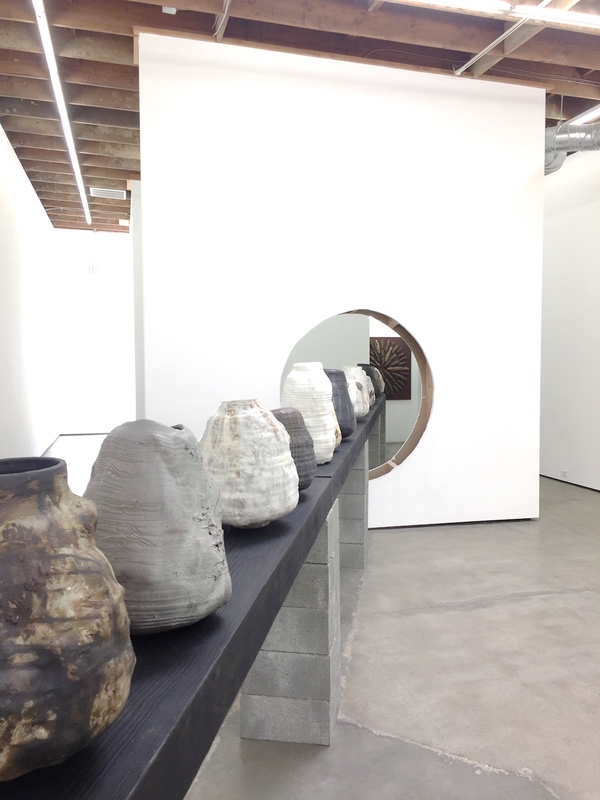 Silverman, who was trained as an architect, has chosen to display his trademark ceramic pots on a long dark wooden beam, piercing through the gallery wall. 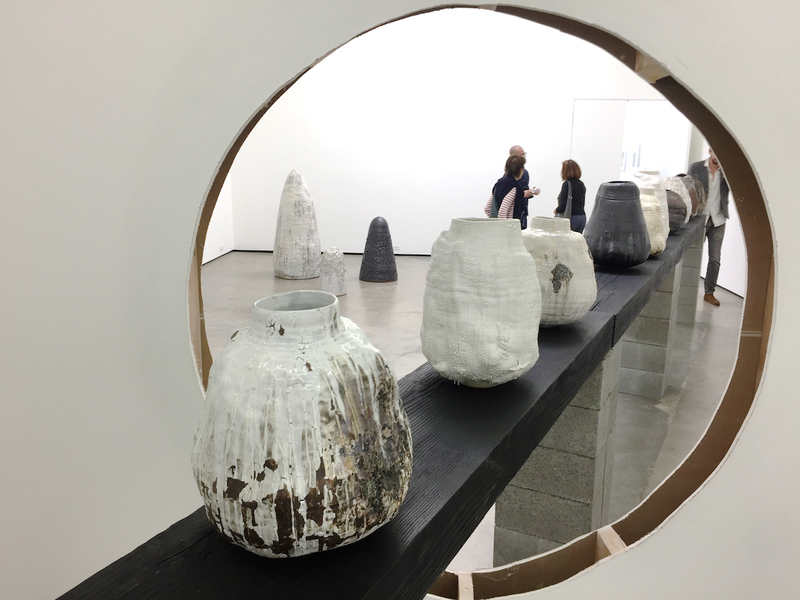 Not too many galleries would allow such a creative violation of its space. 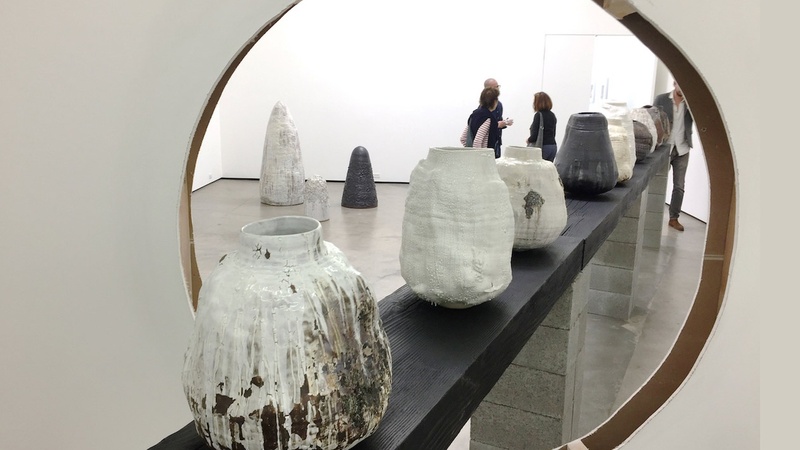 As the artist's trademark, none of Silverman's ceramic pots look perfect. Their egg-like shapes are rather irregular, and their glazed surfaces look scratched and even slightly damaged. All the above, done on purpose, creates the most desirable affect. One simply wants and needs to touch these sculptures, which, contrary to their size, have a bigger-than-life personality. If you have ever had the pleasure of digging your hands into rich garden soil, you will recognize such a pleasure when your eyes touch the rich surface of these ceramic sculptures. 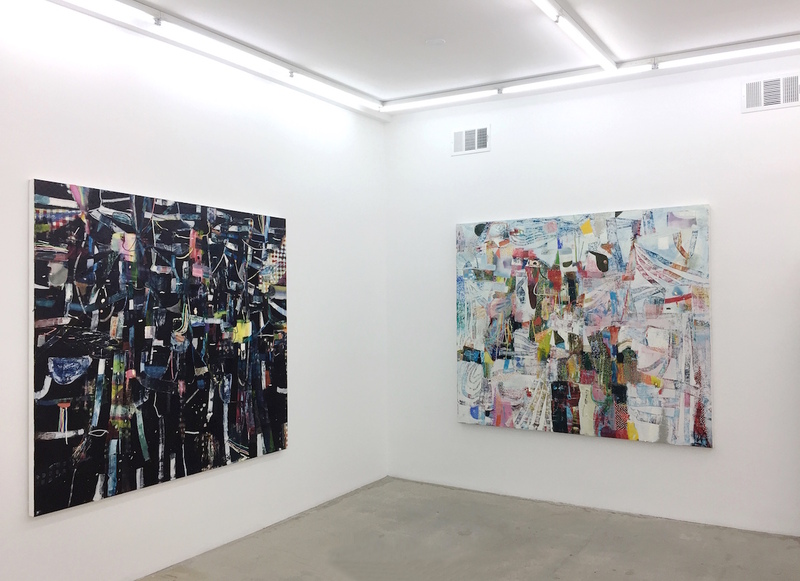 In its second gallery, Cherry and Martin presents paintings by another well-known Los Angeles artist, painter Tomory Dodge, whose abstract compositions, with their bright color and rich texture, come across as a multi-layered conversation amongst several players on a theatre stage. One shouldn't be surprised to learn that besides being a painter, Tomory Dodge is also known for being a skilled musician, with a particular interest in electronic music. To quote the artist, "I do see painting as a kind of recording and recording as a kind of painting" (Cherry and Martin). The eloquence of his statement proves that Dodge is not only good with painting and music, but with words, as well. The exhibition of New York-based artist Josh Reames at Luis De Jesus gallery not only delivers punches, but also burns holes in the most iconic American images. 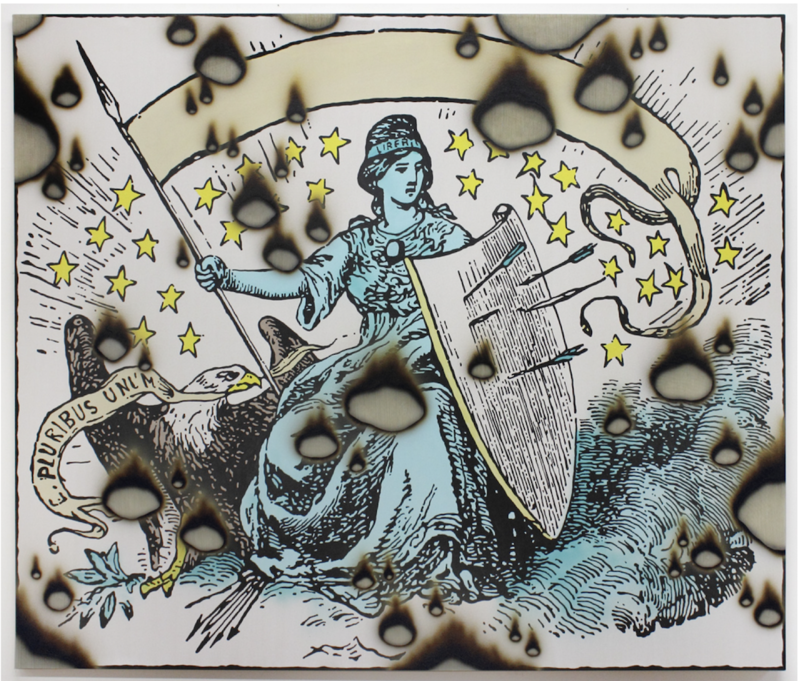 Here is a painting of Lady Liberty next to a bald eagle and dozens of stars, and all that with holes burned into it. But, no matter how realistic these holes look, they are a carefully painted optical illusion of burned holes. 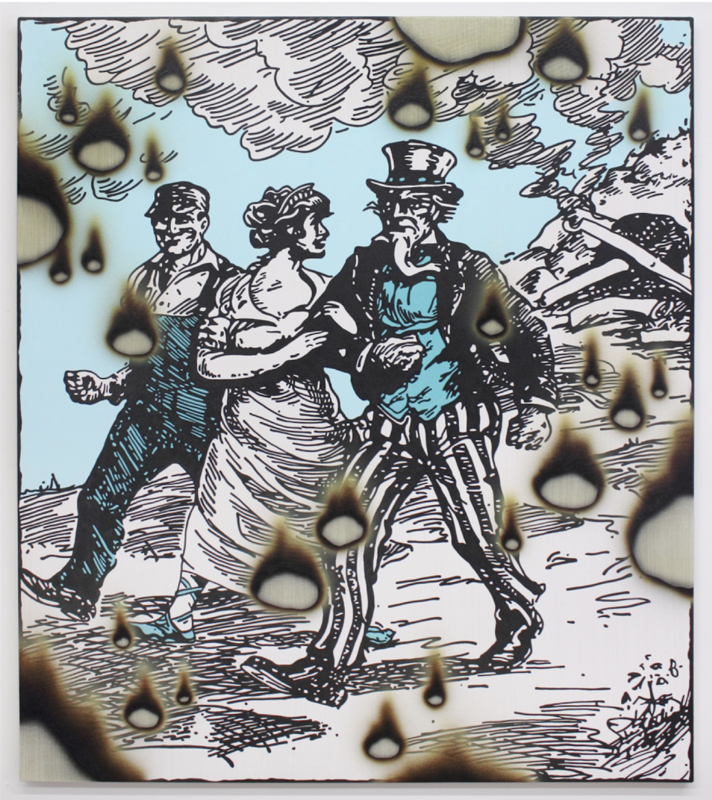 And, here is another "burned" painting, this one of Uncle Sam marching arm in arm with blue collar Americans, with the rubble of war all behind them. 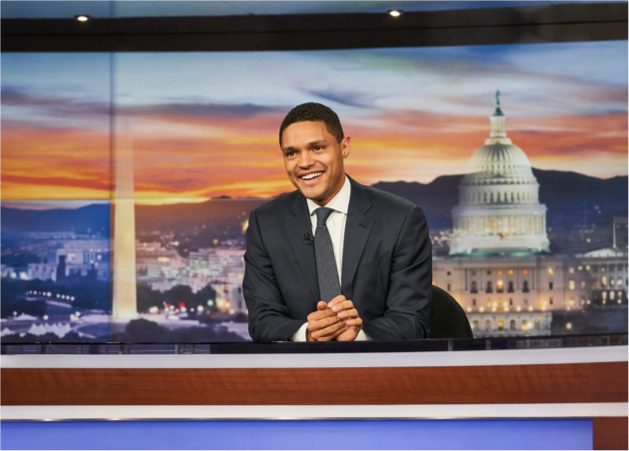 It's difficult to imagine a more eloquent and emotionally disturbing representation of the American dream with its mighty strength and inspiration, along with its undeniable vulnerability. All photos are by Edward Goldman unless otherwise noted.